The calm before the storm, the quiet before the chaos. School is almost out! If you have school-age kids, the start of summer is a great time to give their room and closet a fresh reboot. 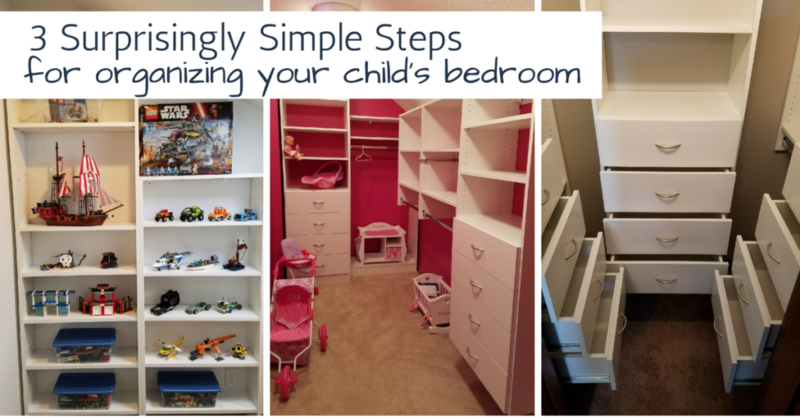 Whether you want to freshen up the whole décor or just want to tackle the mess, here are 3 surprisingly simple steps to not only organizing your child’s bedroom and closet but keeping it that way. Keep – If possible, let your child do the first round on their own. The keep pile will likely be bigger than it ought to be, but you might be surprised at what they are willing to part with! Once they’ve done an initial sort, you can help them take a second look. Donate & Throw – Anything that is in good condition can be donated. Use a critical eye, especially when it comes to clothing. Anything broken or with a hole or stain can be thrown. 1) What things usually end up on your floor? 2) What areas are generally overflowing in your room? 3) Which toys/items do you use every day? After discussing these three questions, you should have a pretty good idea of where the ‘mess-zones’ of your child’s room are. Consider placing some open bins or baskets around the room. We’ve all seen those perfectly organized toy shelves on Pinterest but let’s face it, that’s a photo-staged scene. Give a 6-year old five minutes and every bin will be pulled off and dumped. Make it easier on yourself and your child. Place open bins on the floor for those items they play with daily. It will make it much easier for your child to quickly deposit items back in the bins (and increase the odds that this step even happens). Whether it’s overflowing toys or an overflowing sock drawer, sorting through items will help, but the best solution is storage space that works smarter, not harder. Consider adding a custom closet system to your child’s closet. 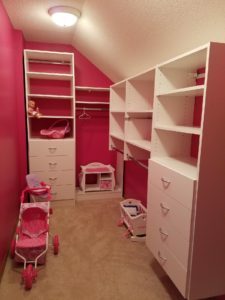 Going beyond the single hanging rod and shelf will have a fantastic impact on the storage potential of your child’s closet. 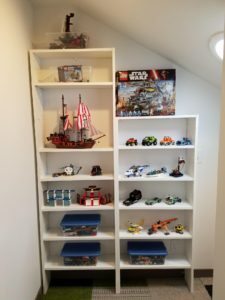 With a custom closet system, you can add drawer space for socks and t-shirts, multiple hanging bars for added clothes storage and open shelves for those toys & books they don’t play with every day. We guarantee this change will dramatically increase your storage space and open up other previously overflowing areas of their room. 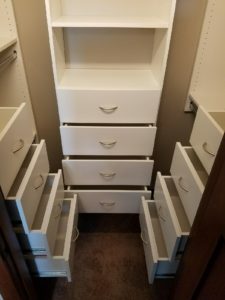 One recommendation – work with a custom organization professional like Closets For Life for this. 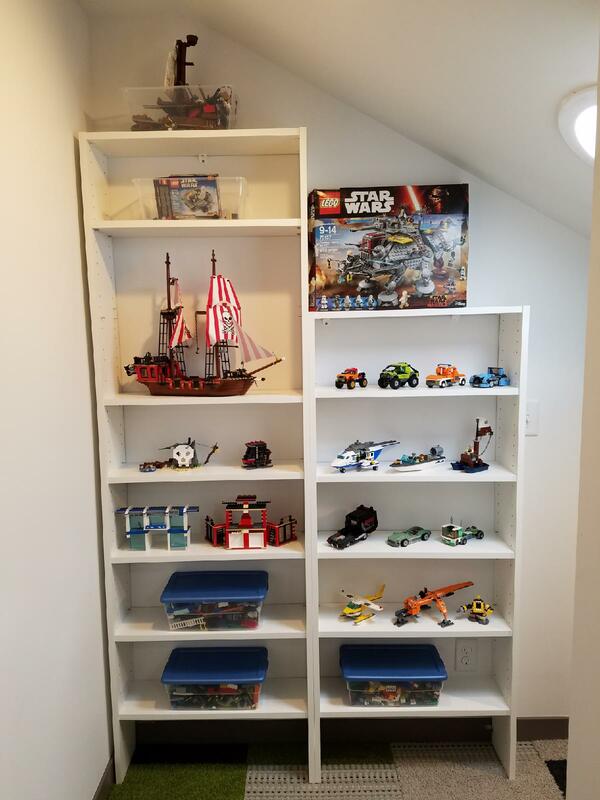 We’ve helped design thousands of closets and can help you identify, design and install a durable and flexible closet system that will grow with your child. We’ve seen too many instances of closet systems sized for infant clothes that no longer work for the child as a teenager or low-quality systems that fall apart after a year of use. While we can’t help you sort through your stuff (we know some exceptional people at NAPO-MN who can help with that! ), we can help you with Step #3, a new organization system! We have experience and expertise designing custom organization systems for every area of the home, including children’s closets, master bedroom closet systems, garage cabinets & shelving, kitchen storage, home office storage, wall beds, home wine cellars & racking and more. Serving the Minneapolis & St. Paul area, we offer free in-home consultations and will follow up our consultation with a free 3D design. What do you have to lose? Contact us today!